This summer we made it a point to be extremely busy, because of our daughter’s 1 year military assignment over seas. We did this deliberately. Our daughter was able to come home for a Mid Tour or R&R to be with their family in July. We were very excited, and a bit anxious of how our daughter would be when she returned home. I was warned by many military families ,spouses and counselors, this is a very exciting time being reunited. And can be even more painful, when the service member returns back to their duty. I was nervous. When our daughter returned from deployment in 2008, she was a different person and we as a family had to work at reconnecting her family back. Was this how it would be when she comes home during her Mid Tour? The school social workers told I needed to prepare my granddaughters. Share with them their excitement of their mother returning and reminding them this was only temporary. Talk about how many days the family will be together and then the date their mother will have to leave. I did just that. I knew this was going to be challenging for all of us. When our daughter returned home, a few days later my granddaughter Ivie had her dance recital. My husband and I drove out to attend the performance. We stayed with our daughter. I tried asking my daughter questions about her experiences overseas and she gave me one word answers. I knew this was similar to when she came home from deployment. My daughter was extremely tired which is understandable traveling from overseas and dealing with the time change, so I let it go. She really did not talk much that weekend. The weekend went by and my husband and I drove back to California. 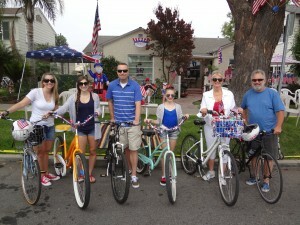 A week later our daughter and her family came to our home in California to spend the 4th of July. Our town is very patriotic, has a 2 hour parade which is televised and evening fireworks. We all rode our bicycles to where the parade route would be. We had so much fun that day. Our daughter spent 5 days with us and it was not until end of her visit, she began to open up. She shared stories about people ,the food the climate and places she had visited and the family began to reconnect with her. She was beginning to be her old self prior to her leaving. We all where so happy laughing at her stories. But we knew this was only temporary it would come to end once she had to return. When she was getting ready to return I decided to stay home and not see her off at the airport. It found it to painful seeing her expressions, her crying, knowing difficult it must be for her to leave her husband and her children. I cried several nights prior to her leaving. I think most family members do the same thing. Once the day came for her to leave and she was in the airport waiting for her flight, she called my husband and I. She thanked us for all we are doing for helping her husband and children. My husband and I know this challenging time is an opportunity for us to know our family even more. Because someday it will all change. It is not easy for any family. We all encouraged one another on the phone reminding us that soon December will be here and this will be all over. We will be back together again. We are on the downward slide to December. This entry was posted in Change, Change, children, community, coping, deployment, families, family, Keep the communication going, living with a guardian, mental health, military, reintergrating, returning soliders, self estem, single parent, Stress, support, Uncategorized, Yellow Ribbon and tagged caregiving grandchildren, children, coping with separation, military families, reconnecting families, service member on August 3, 2013 by Debbie Nichols. How to motivate a teenager? Being a guardian or caregiver to a teenager can be the most frustrating experience. Especially when they don’t follow through with what they have been told to do. I am in charge when my son in law is fulfilling his National Guard weekends and trainings. This type of part time parenting is very different and can be very challenging. Teenagers are rough to deal with. I learned when my children became teenagers I had to keep them at arms length, because they can hurt your feelings. Teenagers are dealing with their own issues and they have many hormonal issues and feelings that keep them from thinking straight and being the child you once knew. What works? What do they love doing? When I was young it was talking on the telephone. For my children hanging out with their friends. For my eldest granddaughter, Ivie its her Iphone and going places with her friends. For the youngest granddaughter, Bailey, we IPAD ( she bought with her own money). Taking those items away impacts them. So its simple. I tell them what to do, if its not done, I will give them a warning. I have a 3 strikes your out method ( like baseball) If I have to say it 3 times. I take a privilege away. That’s motivation. Kids need to learn consequences for their actions. If they do not learn they will not be responsible adults. I will say I do not like having to disciple them, but I do owe it them. So be strong and follow through. Someday your grandchild will say thanking for loving them so much, by disciplining them. This entry was posted in Change, children, coping, families, family, living with a guardian, self estem, single parent and tagged children discipline, motivation, raising children, teenage years on May 20, 2013 by Debbie Nichols. The grandkids are back, but I am mobile! It’s happening again. Our daughter is leaving for a lengthy assignment. This time the granddaughters are staying in their home with their step dad. He is a great guy and wonderful caregiver to our granddaughters. In fact, my granddaughters dedicated their book ,Deployed Kids to him when he was our daughter’s boy friend. This time I will be commuting once a month to Arizona to help out. It’s going to be very different this time while my daughter is away. But we have known this was coming for some time. No matter how prepared you are for a loved leaving, your not prepared for all that you have to do when they are gone. While she is away, my granddaughters and I are working together on having our own radio on demand show on thenew Military Appreciation Channel. Our show will be called – Families Called to Duty. Our show should be aired in January. It is so much fun working with my granddaughters on something so worthwhile. Thank goodness for technology so I can be mobile. This entry was posted in Change, Change, children, coping, deployed, deployment, families, living with a guardian, mental health, military, Stress, support, technology, Uncategorized and tagged children stress, family, grandchildren, separation, Stress, technology on December 6, 2012 by Debbie Nichols. Come join our group! You don't have to be a grandparent!